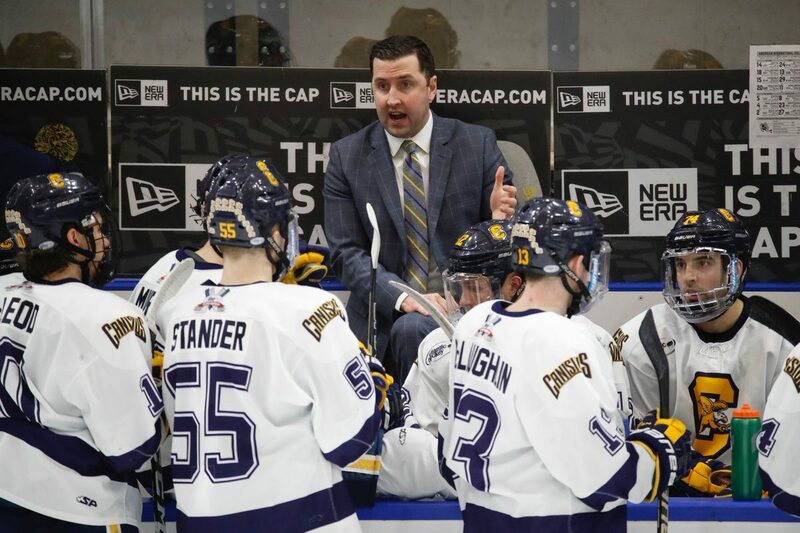 Hobey Baker finalist Dylan McLaughlin will lead the Canisius hockey team into the Atlantic Hockey semifinals Friday night as the program looks to earn its second-ever NCAA Tournament appearance. Second-seeded Canisius faces off with fifth-ranked Air Force, the defending Atlantic Hockey champion, in a winner-take-all semifinal at 8 p.m. in Rochester’s Blue Cross Arena. The winner will play for the championship at 7:35 p.m. Saturday against the winner of the 7-Robert Morris vs. 1-Mercyhurst game. The champion will earn automatic entry to the NCAA Tournament. What to watch: Canisius’ offense goes through McLaughlin, the Lancaster native who is among the 10 finalists for the Hobey Baker Memorial Award, given annually to college hockey’s best player. McLaughlin on Thursday was also named the Atlantic Hockey Conference Player of the Year, joining forward Cory Conacher and goaltender Charles Williams as the only Griffs to win the award. McLaughlin, a junior, ranked sixth nationally with 48 points and 31 assists and has drawn interest from NHL scouts. It’s plausible that he could sign with a professional team if Canisius is eliminated this weekend. About Air Force: The Falcons get it done with defense, ranking first in the conference and 11th nationally in goals allowed per game at 2.31. But that seems more a product of strong team defense than great goaltending, as starter Billy Christopoulos’ .916 save percentage is good but not great. Air Force is lead in goals and points by Erik Baskin (15g, 11a). Season series: Air Force took three of four from Canisius, sweeping a series exactly one month ago. Title history: Canisius won its only Atlantic Hockey title in 2013, beating Mercyhurst in the championship game. Air Force owns six titles, including five of six from 2007-12. The Falcons won one game in the NCAA Tournament over that span.